Eating Meat: Are You Prepared To Kill The Animal Yourself? Zuck Is. Apparently, Mark Zuckerberg’s new challenge for the year is only eating meat from animals he has slaughtered himself. As he spends so much of his time working on the company he founded, Facebook, he says that every year he tries to invest some regular time on a different personal challenge. Last year it was learning to speak Mandarin. This year it’s eating meat from animals killed by his own hand, or not at all. 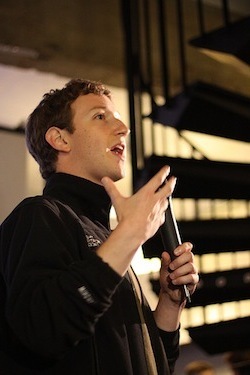 My attention was drawn to Zuckerberg’s new challenge by various tweets I saw about it in my twitter-stream. Some people were supportive and others found it to be pretty weird and disgusting. Personally, I don’t conceptually have a problem with it. As Zuckerberg points out himself, many people don’t want to face that the animals they eat used to be alive, and many people tend to ignore where their meat comes from. He’s facing up to the whole process. What he is committing to is certainly a confronting way to take responsibility for that. Perhaps he will become a bit more thankful and respectful in the process. At least that’s what he says his aim is. Is that weird or disgusting? Not in my book. It’s just that not many people do it these days, as there is not the necessity for most. Zuckerberg seems to have approached the challenge with some care too – seeking advice from a well-known Silicon Valley chef, who has advised him on how best to go about killing his first chicken, pig and goat. He has also been introduced to nearby farmers. Having said that, I understand his first go at killing his own food was boiling a lobster alive, if the Fortune article is correct about that. I thought putting them in the freezer and having them freeze to death is the most humane way to kill them, and boiling them alive is pretty awful. But what do I know about that? Reportedly, he has also slaughtered a goat by cutting its throat, which is apparently the “most kind way to do it”. If you eat meat, would you be prepared to look the animal in they eye, and then kill it yourself before cooking and eating its meat? It’s certainly something to think about if you like eating meat. Yes, but this is nothing new. I’ve been “killing” and eating meat for a long time. So has my son, and so has my grand son. Get a grip, grow up. Meat is not unhealthy. It’s not a matter of healthier or less healthy. You have Canine teeth. Your whole system is designed for a variety of foods. Don’t fool yourself into thinking you are designed for grains. Your not. You have one stomach not 7. Unless your into not saving time, eat meat that’s already processed. Because farming has become harder don’t think your body has changed in it’s needs. As for meat eating vs being vegetarian, there are certainly arguments for and against, and for different reasons. Not eating any meat is not unhealthy, if you eat the right variety of foods. I happen to eat meat myself, most probably a bit too much sometimes. i’m prepared to kill the animal. i don’t take it lightly. i had to kill a chicken called Sandra earlier this year and did my research on youtube (amazing number of videos on the most humane methods). but when it comes to larger animals and harder techniques, i’m just not the best man for the job. i’d like the animal to be killed as swiftly and humanely as possible and there are others much more capable of doing that than me, with better tools. i’m prepared to take the animal to the chopping block, sharpen the knife, clean up the mess, etc. Be pure vegetarian ,most of the blood shedding conflicts in the world are due to non vegetarians,can u eat meat of lion ?,if not then why to eat meat of vegetarian animals ? Vegetarian food,contain all essential vitamins,minerals,roughage,proteins, carbohydrate,fat. Many diseases are because of nonvege. food. Be vegetarian & be healthy, enhance longevity & quality of life . All causes of sorrow is non-vegetarian food. See the paradox –vegetarian animals are eaten by non-vegetarians humans. animals are vegetarian & humans are non-vegetarians!!!!. The point is, most people who eat meat don’t. It should be part of the education process, if you want to eat meat, first you have to kill an animal. If you want to get your bins collected, first you have to work as a binman for a week. If you want to buy factory produced goods, first, work in a factory for a week. An education process like this would certainly help people to grow up.